Great quality product. Washes very well and does not loose shape. My only suggestion is that they make a "petite" length. I am 5'1 and it is a bit too long from ankle to under my knee. It bunches a bit on one side causing a little extra pressure but not too bad. I bought to wear after a calf tear injury and it really helps. I decided to try these instead of the sock type of compression stockings. I love them because they don't cramp my feet. I'm going to buy another pair. This is a wonderful product, it does what it says and washes up nice. The only issue is I am short and so the stocking is a little long. 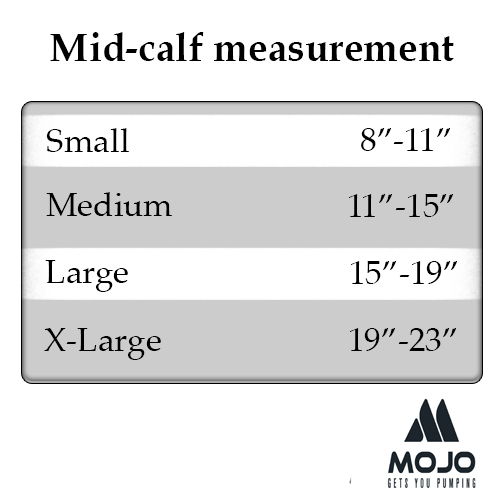 I will measure from the ankle to the knee and order a couple more pairs. I am not sure if this was an option on the website but I should be. Thank you. I had varicose vein surgery on both legs in 2012 and the surgeon recommended wear compression socks. always. since I am very physically active I often wear athletic clothing. I have many pairs of running compression socks and sleeves and they are great but I don't always want to look "sporty". I was very happy to find these sleeves and they are much less noticeable than the colourful athletic sleeves in my drawer. I also have an assortment of compression knee-high toeless stockings, which are widely available in a variety of compression levels, and thus different degrees of sheer. My request to make these a perfect 5-star product would be to offer this style in a more sheer pantyhose fabric, and various shades too, as these look very "medical grade" . I think a sheer compression sleeve would be fabulous and I would knock down your door to buy a pair - or two! I bought one pair for my mother who had swelling in her ankles. These worked great to relieve the swelling and were easy for her to take on and off. I thought I would also try a pair even though I have no swelling. I just thought these might help my circulation, especially on days when I am more sedentary. I hardly remembered I had them on and felt I was doing something good for myself. Highly recommend. I hated the compression stockings I wore that covered my feet as I felt my toes were being strangled! These stockings have helped ENORMOUSLY in that regard. The fit is accurate and I actually don't even feel like I'm wearing anything on my legs. They have greatly reduced the swelling from my venous insufficiency. I would advise anyone needing leg support to give these a try. I purchased these in the large in the 15-20 because one of my legs calf was 18" - only one leg ever had varicose veins or a blood clot. I ended up coming back and buying the XL size instead and they fit better. So my advice is to size up if you are on the border of sizes. Best place to get your stockings! Fine selection of stockings. Takes a while to settle on a particular brand and fit, comfort. Moshe appreciates the business, and he knows what ls what in stockings with big selection. Apparently resized and a comfortable fit. Gone is the pressure ring and sore area above the ankle.. Sleeves stay put as you locate them on the leg all day. Great improvement.